How "free and fair" is it? The commodity markets impact almost everybody on the planet, every single day, because some derivative or variant of about everything that they consume is impacted by those prices. Whether it’s a home loan, or a piece of jewelry, or a fill up at the gas station, or a gallon of milk, or a loaf of bread -- commodity pricing is vastly more important than most people actually realize. In theory, regulation is supposed to set and enforce the rules of the game that market participants play by, in order to ensure that price discovery remains efficient, effective -- and most important -- fair. In practice, there's plenty of debate to be had on how successful our regulators are in effecting their mission. And one investment class in particular, commodities, frequently comes under criticism for questionable price action. So, this week we talk with Bart Chilton, former Commissioner of the Commodity Futures Trading Commission (CFTC), about price discovery within the commodity markets, and whether investors can have confidence in the "fairness" of the current system. [Position] size is an important thing to look at. That’s why in my career as a financial regulator I sought to have limits placed on speculative positions. And unfortunately, there haven’t been. Even though it’s law now, my former agency has not sought to finalize those rules. Size does impact markets and it can push prices around. In electronic trading, even a small size can move prices just because they’re so quick. You don’t need just to have size. If you control 20% of the crude oil market, and I’ve seen that in the past, you make a big trade you can move a market. Well, today with electronic markets and high frequency traders you don’t have to have 20%. You just need 2-3%. If you put a price out there very quickly, it can move markets. When asked directly if there's a manipulation problem in the precious metals market -- silver, especially -- he did not confirm or deny. Instead, he laid out the 4 pillars of evidence the CFTC looks for in determining whether manipulation can be proven: intent, size, trading action, and impact on price. From his experience during his tenure, it sounds like there were a lot of cases where many of the pillars were present, but few where all 4 were in enough abundance to overcome the "dueling economists" quagmire that ensued when bringing the case into a courtroom. Commissioner Chilton is sympathetic to the perception many frustrated and bruised investors have about the precious metals markets -- he himself is on record saying that the large short position concentrations have been outrageous -- and he urges them to share their observations and demands for reform with their elected legislators. Why not the CFTC directly? Sadly, Commissioner Chilton notes, "regulators by and large aren't listening to average people". Chris Martenson: Welcome to this Peak Prosperity podcast, I am your host Chris Martenson. Now, whatever our personal views are on how financial markets operate today it’s essential to know what the game is and how it’s being played. Ignorance of the rules is no excuse, even if those rules are unwritten and constantly changing. What do I mean by that? Beginning around 2007 the rise of computer driven trading algorithms changed the rules, and the markets have not been the same since. They now trade at lightning fast speeds where quotes are massively dominated by computer algorithms, which also account for more than half the volume on the visible portion of the market while so called "dark pools" are more than a third of overall market volume. In short, markets today are not even remotely the same as the markets of just 10 years ago. They are too fast to comprehend and more increasingly hidden from view than ever before. To help us understand the pitfalls and the blessings of these new markets is Bart Chilton, a former commissioner on the United States Commodity Future’s Trading Commission, or CFTC, from 2007 to 2014, and in April 2014 he joined the Law firm DLA Piper as Senior Policy Advisor. He is the author of the agency’s best selling investment fraud book Ponzimonium: How Scam Artists are Ripping off America. Commissioner Chilton has graciously agreed to join us for an explanation of how the US commodities markets work. It’s a topic many of our resource focused members are heavily invested in, both figuratively and literally. And in particular those who track the commodity markets, like myself, have questions about the mechanics and dependability of the price discovery process and I can think of few people more knowledgeable on this topic than Commissioner Chilton. Commissioner Chilton, I’m extremely grateful that you’ve taken time from your busy schedule to join us, welcome. Bart Chilton: Thank you Chris it’s great to be with you. Chris Martenson: So let’s begin with a brief summary of the role of the CFTC. What’s its mission? Bart Chilton: The mission is to do what you talked about just a moment ago and that is to ensure efficient and effective price discovery. These markets—many of the people who listen to you and watch you know this but not everybody does, that the commodity markets really impact almost everybody on the planet every single day because some derivative or variant of about everything that they consume is impacted by those prices. Whether or not it’s a home loan or a piece of jewelry or a fill up at the petrol, at a gas station or a gallon of milk or a loaf of bread. They are vastly more important than most people actually realize and the job of the CFTC is to insure that the prices that are developed that they’re not high or they’re not low, but that they’re fair. And that the price discovery process is efficient and effective. Chris Martenson: So at a very high level then how does the commodity market work in terms of setting those efficient prices? Bart Chilton: It takes bids and offers from myriad traders and comes up with a price and then it’s agreed on, it’s actually transacted and those prices make up the basis on which all these variants of the price can affect people in everyday life. Chris Martenson: So then let’s talk about the enforcement powers that the CFTC has. What are they and how does it typically go about applying them? Bart Chilton: Well they’re vast actually. When people think of enforcement and financial regulator in the commodity space, they think about manipulation as probably the first one but there's other authorities fraud, in particular is one that the agency has looked after for decades. But all the things that go into making those markets efficient and effective. The enforcement division tries to root out any nefarious actions whether or not its fraud, manipulation. Whether or not it’s pushing prices around one way or another and they have a full load, believe me. At any one time Chris, it may surprise people, at any one time there are between 750 and 1,000 individuals or entities who are under investigation by the CFTC. And that’s with a staff in the enforcement division of just 250 folks, just under 250. So they’ve got a big job and they aren’t actually able to get to all of these cases as much as they would like and that’s a big problem going forward. Chris Martenson: Well certainly just from a capacity standpoint but also I would imagine that with the rise of the computer trading there’s been just whole new technologies to understand, new approaches, new processes. There’s quite a lot to just stay current on let alone prosecuting the existing case load, right? Bart Chilton: You’re spot on Chris and it’s not just the people power. With the advent of electronic trading and of high frequency trading, the technology needs at the agency are greater than they’ve ever been. In the recent budget request just a few weeks ago they requested upwards of 50 million dollars for increases in technology to try and keep up with the market. That’s accompanied also by staff but trying to figure out what’s going on based upon the old way of thinking and the old tools just doesn’t work anymore. These markets have changed in monumental ways. You noted that almost 100%, I mean it’s just shy of 100% of markets are electronic trading now—99 plus percent. And of that, roughly 50% depending upon which market it is or which exchange is taking -- looking at the trades, that’s high frequency trading. It’s usually described between 30 and 50% in commodity markets and then about 50% in equity markets but that’s been increasing of late in commodity markets and at some point I think most of the trading will be high frequency trading in all of these markets ultimately. Chris Martenson: So I’d like to talk about that high frequency trading. You’re talking with a gentleman here who has spent a lot of time actually trading on futures markets. I did it for a number of years and so I got very used to the rhythm and the flow of the market seeing what bids were there, what the ask structure would look like and there was some rhythm to them. Now when I look at a market—and it could be gold, it could be silver, it could be oil, it could be wheat, but I will notice that to understand what happened in a severe price moving event sometimes requires us to parse the data down to millisecond resolution and notice that an entire bid stack was destroyed in maybe 200 milliseconds or maybe a second. A concentration of orders will just flood in at very precise moments in time. First your comment on that, and second: Is it unfair for me to say that doesn’t look like legitimate price discovery? Bart Chilton: Well two things, one it doesn’t mean that there’s not some value still even though it’s going to be small with regard to floor traders. As a former trader yourself my guess is that you would tell us you think there’s a lot of value to what those guys do. And I still think there is particularly at the open and close when there are lots of bids and offers and I think floor traders actually have a way of keeping some order to markets, many times through loud voices or hand signals. But I still think there’s a value there but the business proposition for the exchanges for keeping the lights on and the heat running at these -- air conditioning at these trade floors probably just isn’t there in the long term. It doesn’t mean there wasn’t some value that computers don’t have is my main point. So the question about whether or not a flood of orders is good or bad or is it the right price discovery is one that a lot of people have been thinking about lately and by and large the research that’s come out even just in recent days from the bank of England show that actually price discovery is improved through all of these orders. And it goes back to a very basic premise of liquidity. So the more people that are trading the greater liquidity, and the greater liquidity the better price discovery because there’s more people out there to either make bids or offers. And again if it was just me or you contending one way or the other it would be hard to defend, but the numerous studies that are out there sort of showed that price discovery is better with more trading. There’s also just really in the last several days a Baron’s report that showed similar results. So it’s almost to the point now where people are accepting that it’s good but the issue that I’ve been raising over the years is there’s something that regulators need to do differently because of these metastasizing and morphing markets and I think there is. Chris Martenson: It’s interesting, what I notice is seeing -- like I was watching this in the oil market and it happened for awhile, somebody would go out and take a lot of positions, say, put positions on USO. They would take some put positions over on the major equity indices and then there would be this flood of sell orders that would come into oil in the futures market. And so it feels for me it’s not just a single market anymore, that there are trading strategies which straddle markets and allow certain individuals who have the ability to move prices to do so in a way that seems to—obviously they do it because they make money doing it. But to me that feels more like a trading strategy than legitimate price discovery. Is the argument then that even those strategies such as they are, which are merely executed to scoop money from the market, that that still provides an important market service? Bart Chilton: It does provide an important market service. Now look, don’t get me wrong I mean there are many as you say complex trading strategies that look at multiple products at the same time and make determinations about what bets they should place and it’s more complicated than ever. But different doesn’t mean that it’s you know derogatory, that it’s negative in any way. It just means that we need to look at things differently. And be careful, we shouldn’t just accept it with open arms and open eyes, let’s be careful about how we deal with these things. The size is an important thing to look at and that’s why for my career as a financial regulator I sought to have limits on speculative positions and unfortunately that hasn’t been, even though it’s law now my former agency has not sought to finalize those rules. So size does impact markets and it can push prices around. In electronic trading even a smaller size can move prices in a way just because they’re so quick. So you don’t need just to have size. So if you control 20% of the crude oil market—and I’ve seen that in the past—just by moving your trades, it doesn’t have to be fast trades, you make a big trade you can move a market. Well today with electronic markets and high frequency traders you don’t have to have 20%. Just 2-3%, if you put a price out there very quickly it can move markets. But that doesn’t necessarily mean it’s bad if you are abiding by all the rules and regulations. So you’ve seen recently a number of cases regarding spoofing, and that is putting out bogus bids or offers in order to try and move a market. So there are rules, regulations, laws that guard against these things but regulators shouldn’t just assume that everything should be static. They need to look and be more nimble and quick and look around the corner at how markets are changing in the future to ensure that the price discovery process is continuing to be efficient and effective. Chris Martenson: Well let’s talk about the size and concentration of orders in a market or concentration of holdings. There are many out there—I’ve been reading this for years—who watch the precious metals market, in particular the silver market, feel frustrated by what they perceive as clear evidence of price manipulation and have the CFTC looked into it. I’d love to get your comments both in terms of what the CFTC found or didn’t find in terms of price manipulation and importantly the concentration of positions held by a couple of big players out there. Bart Chilton: Sure. And I’m somewhat limited Chris as you know in what I can say; I can’t release any confidential information from the investigation that the agency had. But I would tell you that there are four different criteria for manipulation. When people talk around their dinner table or with their neighbors over a beer, they talk about manipulation and in a context of what they think it means. But they don’t talk about it from a legal standard. From a legal standard there’s really four pillars in the commodities world. There’s a different set of pillars under the SEC’s 10B5 rule but in the CFTC it’s a 6C rule that deals with these four pillars. The pillars are intent, size, trading action and then an impact on price. And let me just spend -- if you allow me a little bit of time explaining these things in more detail. Bart Chilton: So intent means I have to find something. It could be an email; it could be a wire recording because all the traders are required to record their telephone conversations. And by and large you know traders talk with a lot of bravado about what they might do, whether or not they do or not is one thing. But such evidence, as you might imagine—and we looked at the LIBOR scandal, there was plenty of evidence where traders talked about pushing the LIBOR rates around and use sort of out their language and talked about “If you do this for me I’ll buy you a bottle of Bollinger” or “I’ll send over some Thai food," things like that. So the intent is actually something that was pretty easy to get because of how traders operate. But then you have to have size, so you had to have a large enough position that if you used it, if you traded it, that it could roil a market, and then you actually have to show the trade. So you can’t just say I’ve got the size and talk tough, you actually have to make the trade. And even if you found all those three pillars Chris, you’d still have to hurdle over the last one which is that trade impacted the price. And what happens a lot with those is that if you were going to go to court with somebody and say “Look you had these four pillars and you impacted price” well they’ll hire their economist to say “How can you say that this trade impacted price when there’s so many things going on in markets that can impact the price?” So it gets to be dueling economists. So the standard is a fairly high standard, those four pillars for proving manipulation, and with regard to silver, the agency never got to where they had all four of those pillars. And while I can’t talk in detail, I’ll just say that didn’t mean that there weren’t some of those pillars. But there were not sufficient to reach that level where you could go forward with manipulation. There were significant concentrations of size in excess of 30% of the silver market at one point and I spoke about that years ago publically, it was something that drove me crazy that we would continue to allow one trader to have such a large concentration. It’s one of the reasons why I continued to say that we need speculative position limits and I’m amazed that the agency still to this day has not finalized a rule in that regard. Chris Martenson: And what’s the hold up on that? It seems pretty obvious to everybody that makes sense that concentrations of size are market moving events and also they create the potential for market weakness or structural weakness if that one position gets in trouble one way or the other. What’s the hold up do you think? Bart Chilton: Well I know what the hold up is but I don’t buy it; so I’ll give you the argument. The argument is that a law went too far and end users, those that actually have skin in the game whether or not it’s an oil company or an agriculture company that actually are hedging their price risk in the market whether or not they should be exempt from limits and I think they should be. They weren’t why we have a big problem. Now if it was speculative positions that a large agriculture company or large oil company has that’s a different matter. But if they’re just hedging their risk they should just be exempt. But what the agency has been doing is trying to slice and dice different variations of what an end user should be required to do and it gets very complicated very quickly. But there are agreements to buy energy in the future if certain conditions are met. They call it volumetric optionality. So you have an option to enter into a contract in the future. Should that be allowed? And if that’s allowed, does that constitute a hedge? So there’s slicing and dicing this thing and I think sort of dancing on the head of a pin here and to me we should just exempt end users from anything that remotely looks like they’re hedging the risk and get the rule in place for the excessive speculation folks, which is what has been the problem and the reason that I fought for these position limits that were part of Dodd Frank passed in the summer of 2010. But the reason that I sought them—I was the lead guy seeking them—was not because of the end users of course, it was because of unbridled speculation that was I am sure, and studies have proven it, was the speculation was causing divergent price moves. All you have to do is go back to 2008 and look at crude oil at 147.27 and supply and demand had stayed relatively constant for several months prior to that when prices were down in the 90’s. There's no explanation other than speculation for those price moves. So I hope the agency will get on the horse again and get these things passed as soon as possible. Chris Martenson: Oh absolutely because as you mentioned at the outset the things that trade on the commodities futures board, those impact everything, every facet of life, whether it’s the price of oil across the whole globe or the price of wheat or the price of gold, silver, all these things. Everything is sort of hinged off of that. So from my mind these position limits seems like a very obvious, easy way to start. We’ve been looking at it for a long time though so, how do concerned Americans weigh in on the conversation if they wanted to? Bart Chilton: Well it’s difficult because this is like in the bowels of a regulatory agency and my experience, although I think I was different, is that the commissioners don’t listen a whole lot to average folks, unfortunately. Maybe that’s changing; I hope that’s changing. Kudos to any of the commissioners that respond to individual emails. I did that all the time, 24/7, 365. Since they don’t by and large -- since they aren’t very responsive to individual citizens who write to the agency, the way to pressure them is to actually go to your member of congress and tell your member of congress that the law requires position limits to be implemented and the agency has not done so and members of congress should put pressure on the CFTC to do so. It’s a little bit of a contorted way to influence regulators but my experience has been that the regulators by and large aren’t listening to average folks, very unfortunately. Chris Martenson: Yeah that is unfortunate. So, long process when you have to get Congress involved, but it may be worth it because it’s an important issue. So as a final question: Obviously trading in futures is risky business, maybe not for the average person but for people who are interested in potentially becoming involved in using futures as a means of diversifying their portfolio or as a stance, would you at all advise an average person this day that this is something that they should think about with some cautious study, maybe dabble in, or just no way, this is just a pros game now; you have no chance? Bart Chilton: No I wouldn’t say that people shouldn’t get involved in it but I’d be very careful and do your homework. And you’re not going to just -- it’s different than it was sort of back in the day where you said “Hey I’m going to go long on Microsoft” or IBM and you let it sit there in your portfolio and you checked it every week or so and decided whether or not you want to continue to take the risk. That’s an investment strategy that’s worked for people and it still works for people. But futures are a lot different than that and prices move around a lot and you need to know what you’re doing and there are expirations to contracts so by and large you’re not going to be in it for years and years. So just be very cautious and have due diligence. And particularly you mentioned Ponzimonium, my book, How Scam Artists are Ripping Off America, do due diligence with whom you trade. So if you have a broker or somebody that’s doing your bidding for you, insure that they’re the real deal. These fraudsters pop up, Chris, and they do some crazy things. There is even one that created a fake website, and you might not think that’s too unusual, they create a fake business website. But here’s the nutty thing, this particular firm even created a link to a fake regulatory body. I forget exactly what they called it but it sounded a lot like the Commodities Future Trading Commission, it might have been the Commodities Future Trading Association. And then this person fabricated a letter that said that the bogus company was in good standing with the Commodities Future Trading Association. So my only point is that the scamsters and fraudsters out there are very creative and folks need to be sure that they’re investing their money with real folks. A lot of these people that take advantage of average folks are neighbors. They are what we call affinity fraud; they’re a relationship that somebody knows and "you’ve got to get into this good deal." So anyway, be careful and Ponzomonium: How Scam Artists are Ripping Off America is now free online at GPO, government printing office, at GPO.gov and so there’s listed in there I think it’s 20 red flags of fraud. So I encourage your folks who are paying attention to this before they invest their hard earned money check it out. Chris Martenson: Well fantastic and along with those red flags is there any guidance on where to go to do your due diligence? Maybe the FINRA website, other places, do you help people with the process? Bart Chilton: Yeah the National Futures Association is a good place to go. You can check with the exchanges where your contracts are being traded. If you want to trade in metals, you’re going to be trading probably at the New York Mercantile Exchange and you can go to their website which is the Chicago Mercantile Exchange Groups website. If you’re going to be trading in things that are traded on the Intercontinental Exchange, go to their website. All those things are good and one of the places that’s relatively new, but people can go, is the Consumer Financial Protection Bureau, the CFPB, just to ensure that people are in good standing before you, again, invest your hard earned money. People just need to be careful. Chris Martenson: Well fantastic and in closing with everything you know that you can talk about with respect to silver, would you invest in it today? Bart Chilton: I really don’t want to say whether or not I’d invest or not. Silver is I think probably going to go up in what looks to me like it might go up but I never want to give investment advice, I’m not a trader, I’m a regulator guy. But it looks like there’s room for growth there but people want to listen to folks a lot smarter than I on this. Chris Martenson: I wasn’t looking for price advice, I was just wondering how the market is structured, if that was a place you feel is legitimate at this stage. Bart Chilton: I wouldn’t be concerned about how the market operates right now. But you know regulators need to stay on top of this and insure that that’s the case; so I would encourage anybody who sees any anomalies in markets, whether or not it’s silver or anything else, that they do report them to the regulator. As much as people think that they don’t pay attention to all these things, you do the best you can do in life and sending it forward certainly can’t hurt. Chris Martenson: Fantastic. Well Commissioner Chilton, thank you so much for your time today. Bart Chilton: Great to be with you Chris, thank you. Bart Chilton (born May 1, 1960) was a commissioner on the United States Commodity Futures Trading Commission (CFTC) from 2007 - 2014. In April 2014, he joined DLA Piper as a Senior Policy Advisor. He is the author of the Agency's best-selling investment fraud book, Ponzimonium: How Scam Artists are Ripping off America. Chilton has been a vocal supporter of position limits in commodities markets. He has exposed manipulation practices in commodities markets and gone on record as wanting to prosecute violations of law, which he believes have taken place in the silver market. I think Bart is a controversial person to interview given your audience here (people concerned with the ability of the government to do their job). I will listen to it later. Jim, that chart has been the same for many years now, yet nothing has happened regarding it's implications. Looking at the chart below, would you agree that the number of short positions by the banks did not have the impact you would expect on silver price in 2010? Given that the chart is both the same in bullish and bearish periods, wouldn't that imply that the reason for the price decline is not found within that chart? By the end of this month/next month I think we will see the silver price move back up based upon price patterns. It' been a long winter, and I have not really even looked at silver prices until now, but I think it is now time to start paying attention to the metals again. So here's something you can read two different ways. Commercial shorts seem to pick tops and bottoms pretty well - except for the spike high in 2011. But certainly lately, a concentration of commercial silver shorts seems to mark the highs, and a decrease in shorts marks the lows. Kind of feels like its a money-maker for someone. So either they are causing the peaks and the valleys, or they simply have a pretty good sense of when they will probably occur. Presumably, if one player is able to own 30% of the market, they can pretty well set price at least in the short-ish term - if they are willing to pay the money. But it is interesting how they got the year 2011 mostly wrong. That is a great additional chart Dave. Thanks. The only correlation within the time period that I see in that chart is that there may be a relationship with extremes and price movements. I which case, this is may be another indicator that we are do for a price movement shift within the next month or two. In a nutshell, the FTC is hopelessly understaffed to accomplish their objectives. Second, the laws favor the people involved in questionable behavior, rather than the honest investor. It sounds a lot like the criminal justice system. Therein lies the argument. Our legal/justice system is hopelessly misguided and ineffective. It reminds me of a leaked, tape recorded quote from a Goldman Sachs Executive. Paraphrased, once a person reaches a certain wealth level, they are above the law. There are manipulations going on in different layers, on different timescales. To my view, saying that there have always been a lot of Silver shorts makes it sound like the situation regarding futures is not dynamic in this longer term time scale - it is actually. All of these contracts you see accounted for in your 2010 snapshot had an expiration date - some month out in front. That means that, in order to maintain the large short interest.. the contracts are constantly having to be rolled (closed and reopened)... and renewed. The giant short interest has to be maintained... it is a fortress of sorts. I see the short interest fortress as this; A well established and continuing oversupply of synthetic futures contracts in a Silver market where price is discovered based on supply vs. demand for futures contracts. That is layer one.. the long timescale layer of manipulation. It is just possible that the demand for futures contracts in 2010 was so insatiable that the fortress was overrun for a time.... we all know what happened next in terms of coordinated margin increases and futures contract dumps. The shorter timescale manipulation is the dumping of massive numbers of naked short contracts into often illiquid markets. Since the COT reports only show net positioning on a weekly basis, the big players can make their dumps, and then cover after they have created the down wave. 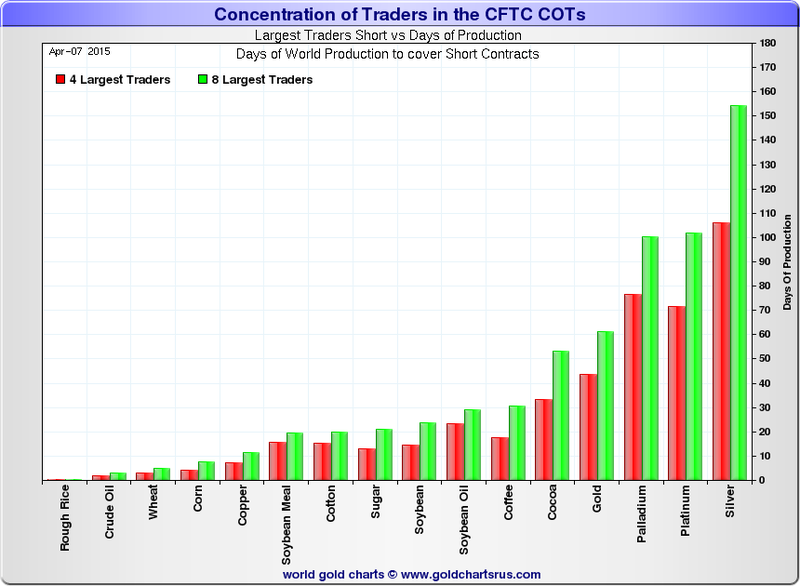 A final note; One may ask, why so many more Silver shorts vs. Gold? Simple to my mind; the bullion banks, in league with the Western central banks control much more Gold than Silver... So they have other options for creating synthetic supply (via fractionalization schemes like leases and swaps) in Gold that they do not have for Silver. 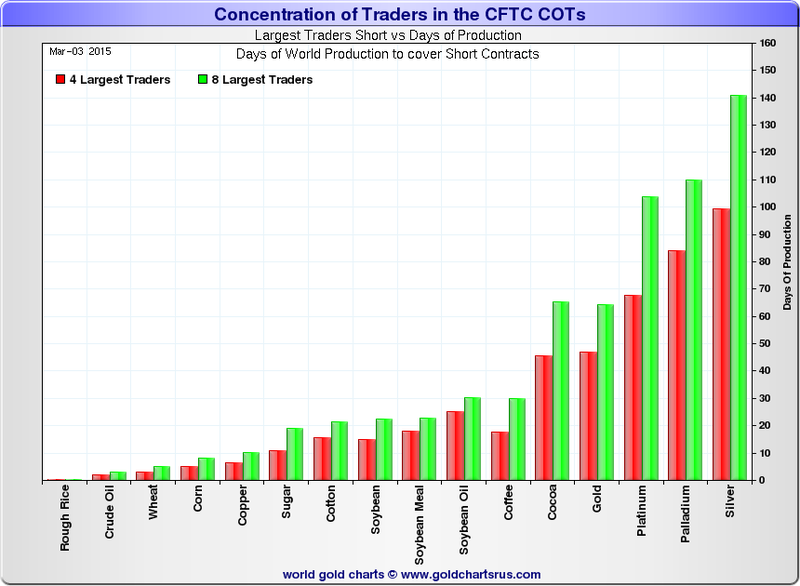 Most of the synthetic supply for Silver needs to come via the Comex futures scheme, and so it does. "Ah, ah... ah" Yes, the silver market is rigged he just cannot say it. I cannot believe I got through the entire interview without smashing my keyboard. I'll get the innocent until proven guilty comment out of the way first. A couple of things....I was SHOCKED to here him imply (about 9 minutes into the podcast) that high frequency trading is a good thing for markets. Either I really don't understand how markets work at all, or the regulators just don't see the risks. "Price discovery has improved through all of these orders..."
The other part of the interview that I found fascinating was when Chris asked the question about manipulation in the silver markets. Bart Chilton went out of his way to explain the four pillars where illegal manipulation can be proved. Key concept, key point.....manipulation being proved. It is sad to think that everyone involved knows manipulation is likely happening on some scale, but little can be done about it. Is it even possible to prove Intent in a HFT market....again....Chris and Chilton talked about nearly 50% of trades today being high frequency trading. Ya....after listening to this I think buying physical metals is sound. This site offers a great introduction and overview to the mess our monetary system is in. It starts off a bit slow but it is clear and good for someone new to where we are or anyone frankly. Reminds me of the crash course with more focus in one area. Certainly worth the read. I apologize for the frankness of this post. It sounded like Chris made a clear example of manipulation where an entity buys puts in the crude market. Then that same entity goes into the market and uses its ability to move markets to effect the price and make money on the bets they just made. This is not a trading strategy it is fraud, and as such is illegal. How exactly did Chilton say this is not necessary bad. He is either stupid, or much more likely corrupt. I know some had hopes he would help some of the manipulation when he came to the CFTC but its clear he's been compromised. Not surprising considering he now works on the other side of the fence. I really hope Chris writes a piece exposing the issues with this interview. Lots of big words, always a plus. I became confused and felt lost after hearing "Bank of England" and "efficient markets" in the same thought train. I found his manscaping distracted from the content of the podcast...particularly the aviation blonde. But I'm glad Chris is willing to post interviews with people who might not agree with him. It gives the site more validity, and if we are unwilling even to listen to counter-arguments then we're heading down the same path of ideological blindness we accuse most members of the financial world (the Fed) of having. JBarney, Yeah, I'm with you. More players mean greater price discovery? How is that possible when interest rates are zero and some, all, most, many have access to the free money? With free donuts, and a bank of algo makers, the number of traders is irrelevant I would think. Very glad Chris interviewed Bart Chilton. Reminds me of someone who jumps off a 100 story building and when he gets to the second floor says, "So far so good!" Wake me up when someone debunks "The Thing" with cogent argument. I interpret All as symptoms. There is no way out but Up. A group of sociopathic megalomanics walk into a bar on a planet they own. They laugh and heckle, scheme and conspire (as they always do, and always have), not noticing the dark, faceless figure that has appeared at the end of the bar. "Who are you? This is a private party for important people, leave now!" one demands. The stranger is impassive. Others gather now, annoyed by the lack of respect shown their esteemed colleague. "Why are you still here, leave! We are in charge here! What on Earth do you want?" At the mention of the word, the stranger glares straight into them, these voids which souls have long since left. It slowly occurs to them that, left unchecked, this Thing will take the one thing from them they cherish above all else, their God...Power. I awaken with a shudder. Ugh, what a nasty dream. I grab a cup of coffee on my way out the door, making sure to smile for the dozen or so cameras perched atop lampposts on the daily grind to work. Yes, exactly, All are symptoms. Love your material and insight, Chris. Couldn't help posting after hearing the BS spewed by this guy. You handled it well. Amazing how he completely blew off the wacky market behavior you've been harping on for years as good for the markets and liquidity. WTF, the guy admits he's not a trader and therefore probably doesn't even understand what you, or anyone else who watches the markets with regularity, are talking about. Then he deflects the the subject of market manipulation to the topic of retail scams which must be an easy fallback position to appease the sheeple. He is definitely a smooth operator, masterful in pushing convoluted BS and navigating the upper levels of the asylum. I've often thought it would be good to get the occasional controversial guest onto these podcasts because so many of the guests are aligned so closely to our own way of thinking. I think hearing alternative viewpoints force us to sharpen our understanding. GRADE A 100 % BULL COOKIES!!!! 1) I favor the free exchange of dissenting ideas, and support Chris for having interviewing Mr. Chilton. 2) We should acknowledge that Chris has to use moderator decorum and tact, so I did not expect a severe challenge or strong language, though I thought the questions and follow ups were too soft considering the responses by Mr. Chilton, but after all, it is indeed Chris' site. With that said, I feel compelled to completely rebut Mr. Chilton's comments. Because some new readers may read these falsehoods and actually be swayed by these nonsensical statements. There are so many wrong ideas promoted in the interview, it is truly a target-rich discussion. It is important to focus on the main ones. The CFTC is a crack enforcement agency, and is effective at policing the futures markets. "At any one time Chris, it may surprise people, at any one time there are between 750 and 1,000 individuals or entities who are under investigation by the CFTC. And that’s with a staff in the enforcement division of just 250 folks, just under 250. So they’ve got a big job and they aren’t actually able to get to all of these cases as much as they would like and that’s a big problem going forward." Bull cookies. With the vast amounts of untold billions being made by criminal trading (see below), and even larger damage to the average investor, the CFTC enforcement record is a tiny pinprick. Trillions and trillions of dollars move through these markets. One of the largest markets, the derivatives market, is thought to be over a quadrillion dollars and is almost completely unregulated. The CFTC openly acknowledges this, and whines about not having enough staff, which may be partially true, but I do not have any confidence that if their budget was increase and legal framework introduced, that they would be any more effective, based on their abysmal track record. Of the remaining markets of trillions of dollars, and tens of billions of dollars of profits, and in spite of these alleged thousands of entities under investigation, in actual reality the CFTC reported that there were 240 new investigations and 67 enforcements for a total of $3.27 billion in monetary sanctions in 2014, http://www.cftc.gov/PressRoom/PressReleases/pr7051-14. And if one takes just a cursory look at the enforcements, the largest was the LIBOR judgement of $580 million. This may sound like a lot, but spread out over many global banks, all who are making billions of dollars of profit, apparently often from illegal and fraudulent trades, $580 million is a pinprick and is nothing more than a PR soundbite than any meaningful and serious enforcement. The vast majority of the other enforcements listed are to my eye simple fraud, and for tiny to minute amounts, relative to the market size. I note that 17 defendants had criminal judgments apparently. None of them named Corzine or Dimon to the best of my knowledge. None of the enforcements, upon inspection, with the sole exception of LIBOR, have anything to do with true punishment for market manipulation of trillions of dollars of critical commodities and other assets. These "enforcements" are pinpricks, and would have zero effect on market participants that are committing fraud. It is like writing $1 dollar speeding tickets once a year to chronic speeders. Did you really expect them to change, Mr. Chilton? So, apologies if I don't give a standing ovation to the great enforcement work of the CFTC. I tend to favor results over activity. No one was ever extricated from a burning car by good intentions. 2. HFTs are an improvement to markets. "You noted that almost 100%, I mean it’s just shy of 100% of markets are electronic trading now—99 plus percent. And of that, roughly 50% depending upon which market it is or which exchange is taking -- looking at the trades, that’s high frequency trading. It’s usually described between 30 and 50% in commodity markets and then about 50% in equity markets but that’s been increasing of late in commodity markets and at some point I think most of the trading will be high frequency trading in all of these markets ultimately." "Well two things, one it doesn’t mean that there’s not some value still even though it’s going to be small with regard to floor traders. As a former trader yourself my guess is that you would tell us you think there’s a lot of value to what those guys do. And I still think there is particularly at the open and close when there are lots of bids and offers and I think floor traders actually have a way of keeping some order to markets, many times through loud voices or hand signals. But I still think there’s a value there but the business proposition for the exchanges for keeping the lights on and the heat running at these -- air conditioning at these trade floors probably just isn’t there in the long term. It doesn’t mean there wasn’t some value that computers don’t have is my main point." Total Bull cookies. This statement isn't even able to be interpreted. I really don't exactly know what Chilton is trying to say. "Floor traders still have value", even though they are less than 1% of trades??? As museum exhibits? The mere fact that competing firms are building servers closer to exchange servers to gain milliseconds of trading (e.g. front-running) advantage, tells you all you need to know about how corrupt the markets are. If a trading firm had superior analytical skills, superior algorithmic predictors, superior research and understanding of markets, superior trading positioning strategies, in other words, market participants were participating on the basis of free market fundamentals as opposed to thievery, you would not need millisecond advantages in trading. The arguments have been made by the HFT firms that HFT adds "liquidity" to the markets. "The problem is that the CME has relied on High Frequency Trading (HFT) and other speculative trading schemes to pump up trading volume to drive corporate profits. This is a problem because it has forced the COMEX to cease accommodating real producers, consumers and investors in silver, gold and copper and instead to cater to those trading with HFT computers and to those speculating in large quantities of electronic contracts. There are finite amounts of commodities available at any given time, and a finite number of market participants. The numbers of trades may grow over time, as will numbers of trades naturally, as market sizes grow. But trading speeds and raw numbers of trades have vastly outgrown the natural, organic grow of markets. But more on liquidity next. 3. Naked shorting is good because it increases liquidity. "So the question about whether or not a flood of orders is good or bad or is it the right price discovery is one that a lot of people have been thinking about lately and by and large the research that’s come out even just in recent days from the bank of England show that actually price discovery is improved through all of these orders. And it goes back to a very basic premise of liquidity. So the more people that are trading the greater liquidity, and the greater liquidity the better price discovery because there’s more people out there to either make bids or offers. And again if it was just me or you contending one way or the other it would be hard to defend, but the numerous studies that are out there sort of showed that price discovery is better with more trading. There’s also just really in the last several days a Baron’s report that showed similar results. So it’s almost to the point now where people are accepting that it’s good but the issue that I’ve been raising over the years is there’s something that regulators need to do differently because of these metastasizing and morphing markets and I think there is." In contrast to Mr. Chilton's reference to the Bank of England (actually a co-conspirator with other central banks in price manipulation, so forgive my lack of confidence), a report in the Connecticut Law Review asserts that HFTs are likely illegal. "This Article posits that some high-speed pinging tactics violate at least four provisions of the Commodity Exchange Act—the statute governing the futures and derivatives markets—and one of the regulations promulgated thereunder. The better approach is not to view high-speed pinging as a form of front running or insider trading, but as analogous to disruptive, manipulative, or deceptive trading practices, such as banging the close (submitting a high number of trades in the closing period to influence the price of a contract), spoofing (submitting an order for a trade with the intent to immediately cancel it), or wash trading (self-dealing, or taking both sides of a trade), all of which are illegal." Gregory Scopino, Connecticut Law Review, February 2015. Regarding the liquidity issue, this is the number one talking point of many people, including Davefairtex, who would defend criminal and corrupt markets, all in the name of glorious and magical "liquidity". First of all, "liquidity" is an unnecessary $2 word created by economists to make them look smart and confuse people so as to steal their money. activity. Assets that can be easily bought or sold are known as liquid assets. 2. The ability to convert an asset to cash quickly. Also known as "marketability." So it is the "the degree to which an asset can be sold without affect the asset's price? What are we talking about precisely? The entire point of markets is for assets to be bought or sold and have price affected, if there are imbalances in supply and demand. According to this definition, if I and Davefairtex exchanged a bunch of bananas for a dollar once this year, and a year ago we exchange the exact same bananas for the exact same dollar, that would be an infinitely liquid market- price change was zero, correct? Oh yeah, I forgot, "there is no specific liquidity formula". And frankly, if a market is perfectly matching buyers and sellers, and the money supply and wealth creation are stable (i.e. the Fed is not artificially creating inflation as it has done for decades), then prices should be and ought to be perfectly stable and totally independent of the "level of trading". I've got a simple revelation for Mr. Chilton, Mr. Dave, and the liquidity apologists. Markets are not supposed to be highly "liquid" at all times. Markets are supposed to reflect supply and demand. There are supposed to be, by design, natural periods of few sellers and lots of buyers. That is called "price increases". In free markets, prices will rise until buyers and sellers are in equilibrium. There are also periods, also perfectly natural and healthy, where there are more sellers than buyers. These are called periods of "price decrease". This is the natural law of the free market. This has nothing to do with liquidity. The "false liquidity" Chilton and Davefairtex are referring to is corruption of the natural free market. Naked shorting is accomplished by a few "persons and institutes of privilege" market participants. Naked shorting is creating "paper gold". Just to remind Mr. Chilton and Mr. Dave some laws of physics, paper gold is not real gold. I'm referring to the stuff with atomic number 79 and atomic mass of 196.9655 g.mol-1. Not the stuff that are LEDs on a screen or magnetic particles on a disk. Just in case it is not clear what we are referring to. Naked shorted paper gold futures are false certifications that assert that a supplier i.e. market participant has access to piles of physical gold equal to the amount of a gold contract, when in fact, they do not. This should not be called by a fancy name like liquidity or HFT or high volume market activity. To demonstrate how absurd this argument is, if the gold market is a market where alledged physical gold is supposed to be exchanged with alledged cold hard cash, and somehow, magically, the gold "producers" are allowed to "produce" magical paper gold by printing a fake certificate (future contract) of gold that they in fact do not possess and never existed, then please, would the liquidity apologists tell me why the purchasers of gold should not be allowed to produce fake dollars in the exact same way, to purchase the fake gold, e.g. representing dollars that I in fact do not possess. I would very much like to be able to use "naked dollars" that I am allowed to create out of thin air in order to purchase or hedge "naked gold" on these free and fair markets. Is this not truly the most corrupt bastardization of a free market? Markets are not supposed to be "liquid" when supplies are tight and buyers are many, and supplies are plentiful and buyers are few. Markets are supposed to be "illiquid" during certain phases in order to allow true price discovery. The fake paper gold naked shorts and "liquidity" actually do the opposite of they are claimed to do- they harm markets and corrupt true price discovery. "One motive of the manipulation is to operate and control Comex trading in a manner that helps the Fed contain the price of gold, thereby preventing its rise from signaling to the markets that problems festering in the U.S. financial system are growing worse by the day. This is an act of financial terrorism supported by federal regulatory authorities. Another motive is to help support the relative trading level of the U.S. dollar, as we’ve described in previous articles on this topic. And, of course, the banks make money from the manipulation of the futures market. The Commodity Futures Trading Commission, the branch of government which was established to oversee the Comex and enforce long-established trading regulations, has been presented with the evidence of manipulation several times. Its near-automatic response is to disregard the evidence and look the other way. The only explanation for this is that the Government is complicit in the price suppression and manipulation of gold and silver and welcomes the insider trading that helps to achieve this result. The conclusion is inescapable: if illegality benefits the machinations of the US government, the US government is all for illegality." In addition to the immorality and corruption of the current system, we should be very aware that actual harm is being done to average families and innocent workers who depend on producing commodities for a living, to support their families. So apologies if I do not extol the virtues of the "liquid" market composed of fake gold and high frequency trading. A few observations. First, in this day and age of almost non-stop findings and reports that the big banks have conspired to fix prices in almost all the markets they deal in, the COMEX March silver deliveries would seem to certify that they are certainly the kingpins of COMEX silver. I’m sure all these banks could come up with a litany of cockamamie stories as to why they must deal in silver for their own accounts away from the simple explanation that they are just speculating and controlling the market, but you would be hard-pressed to come up with clearer evidence to the contrary than in the March deliveries so far. Second, the fact that JPMorgan, in its proprietary trading account, was the largest stopper of 735 deliveries (3.7 million oz) would seem to coincide with my speculation that the bank has been accumulating physical silver in a serious manner, even as a number of its own customers issued deliveries this month – an apparent conflict of interest. But the biggest concern is this – JPMorgan has been the biggest short in COMEX silver futures since taking over Bear Stearns and the bank’s taking of physical silver deliveries this month has occurred while it is still the biggest short with 18,000 contracts (90 million oz) still held net short. In order for JPMorgan to have taken delivery of 735 contracts this month for their own account and benefit means it had to be long those futures contracts while at the same time being short many more futures contracts. This is permitted by the CFTC and the CME, as commercials can hold open long and short positions in the same month (not allowed for non-commercials), but please step back and consider what I just said. By being the largest COMEX silver short, JPMorgan has exerted the largest negative price influence on silver while, at the same time, has stepped up as the largest taker of physical silver on the COMEX in the first two delivery days of the March contract. Is this not, on its face, the most egregious and crooked circumstance that one can imagine? Manipulate the price lower and then scoop up the metal at bargain prices with the blessing of the regulators. With such blessings, it’s no wonder JPMorgan is considered the US’s most politically connected bank. So... naked short to get the price down via a huge, manipulative short position, then take huge deliveries of physical at the new low price. AND it's all legal! You can't make this stuff up. Market? There is no market... this is a cartel with a unique dual purpose.. to keep the price low, and profit on both the ups and downs via full control of the paper and physical aspects of the market. So speculators on both sides (both "nekkid shorts" and longs who will never take delivery) - properly limited in the size of positions they can take - are essential for providing liquidity to the marketplace. Do you understand why this is so? If the gold market were limited to just fundamental buyers (such as jewelry shops and mines), there would be very little trading, and that would lead to very wide spreads. Instead of buying or selling a gold future for a spread of 30 cents, perhaps you'd pay $5, or maybe $10. This raises the costs of hedging by a participant by a large amount, and it makes the market less useful for its intended purpose. Also, liquidity is important for getting a trade done in a reasonable period of time. If a mine wanted to hedge production for some reason in the above-mentioned situation, they couldn't - not until a jewelry shop came along with an order that just happened to match the delivery date. And likely, the jewelry shop would only be able to buy some small fraction of that mine's production. More participants = more liquidity = a better functioning market for the fundamental users. And that's what speculators do. In exchange for taking risk, they provide liquidity for the fundamental users who can then use the market to actually hedge production or buy forward. More liquidity = cheaper price for hedging, because the spreads are narrower. As a participant in these markets, I can tell you that spreads are a big deal. Narrower spreads = a very good thing. It basically reduces the friction involved in taking a position. Narrower spreads lead to more liquidity, and more liquidity means the market functions better for its intended purpose. And I'll make the point again - position sizing is really important to limit abusive trading practices. Speculation (naked shorts & longs) = good, abusive trading practices by those same guys = bad. Position sizing is the key to keeping the good, while eliminating the bad. Now then, regarding HFT: I think some HFT is great, and some is terribly predatory. The HFT players who are doing "computerized market making" end up narrowing spreads, which as mentioned, is a good thing. They need to operate quickly so they can react and change their bid/offer to react to changing market conditions, but in essence, they are just computerized versions of the old market makers that used to be people. The bad HFT players who use "special deals" offered by exchanges that allow them to front-run other traders and pilfer pennies, as detailed in "Flash Boys", are slimy weasels that need to be stamped out by the exchanges, but who won't stamp them out because the bad HFTs pay the exchange for the right to pilfer and front-run. The solution is described by Brad Katsuyama. I use his exchange for all my trades, since I like to support the good guys. (My broker, IB, lets me specify where I want my trade to go). Now regarding position sizing. Isn't it interesting that CFTC has "been unable" to enforce position sizing for the big banks? I wonder why that could be? I suspect its way too large of a profit center for the big banks to give up on easily. The profit potential attached to the ability to arbitrarily run stops is probably a big number. An entire division's bonus pool probably depends on keeping this ability intact. Bottom line: we need to know what we're fighting for. Not all HFT is bad - but some of it sure is. Let's just focus on stamping out the "bad HFT", not the "good HFT." More participants ends up creating a lower cost product for the fundamental users. And we really need to have that position sizing in place, too. Lastly, by railing against "nekkid shorts" we just show ignorance. Speculators just by definition need to go naked short. This ability increases liquidity, which narrows spreads and helps the fundamental users take positions at a lower cost. And after all, that's the purpose of having the market in the first place. With proper position sizing in place, the daily banker abuses would end. It wouldn't take many fixes to make this all work fine. Position sizing would fix the part of the problem where the banks "profit on both the ups and the downs" - which I agree that they do, and that it needs to be fixed. That said - you still haven't been able to demonstrate any ability by any participant to "keep the price low" or to "get the price down." You are thus assuming facts not in evidence - and in fact where there is substantial evidence against. I must remind you again of that bull market from 2001-2011, all during which the goldbugs were just as sure as you are today that there was a powerful (and successful!) conspiracy to keep the price of gold in check. This, while it rallied 600%! If you just confined your rant to the obvious daily stop-gunning attacks that are most likely quite profitable much of the time, you'd have my full support. And fixing that boils down to position sizing. I always like reading your posts because you explain things and I end up learning something. I like the way you step back and explain some basics. I already understand the importance of speculators and the futures markets when it comes to trading commodities. What I don't understand is the need for leverage - or the "nekkid shorts" or longs, as you say. If I can make money by understanding the particular market better than the next guy, why do we need to sweeten the pot by allowing leverage? It seems reasonable that you 'pay to play' just like a poker game (which may be a apt analogy). Like poker chips, you place your physical metal in the system and then speculate until you lose it all or cash out. If your argument is that fewer people would speculate without leverage, I still think that is preferable to the current system. If I were a jeweler or a miner, I would still prefer a larger price spread to $40 price swings in a single day. The usefulness of speculators is to dampen volatility, not amplify it. ...he really does have nice hair. Just sayin. I have very little stomach for arguing with you about manipulation. It just takes me to a very negative place to do so. I take it as settled fact that the markets are manipulated, and that this comes from the top. You are welcome to your opinion. What I preach comes down to this; You can only really understand Gold through understanding what debt-based fiat currency is, and how it acts, both historically, and today in the new age of central bank (feigned) omnipotence. Gold and Silver should be reflectors of all the risk.. it is up to each of us to decide for ourselves why Gold and Silver are not acting as such for the last few years. Your straw man argument against manipulation is that the markets have risen in the past... OK, fine. Most commentators who I trust, who have looked at the markets through their varied financial experience, see the current manipulation regime as being more extreme than ever before. Here is what Kranzler says.. and this guy is really brilliant, U of Chicago MBA.. can tear apart a balance sheet and do forensic accounting like nobody else in the blogosphere;. The western Central Banks/bullion banks have assumed a “take no prisoners” policy with regard to the precious metals market. They have been printing up and selling into the market paper gold futures contracts and other paper claims (ETF certificates, leases, gold “bullion” investment accounts, and other various sordid forms of paper derivatives) in an effort to offset the enormous amount of physical gold being accumulated by the east in order to hold down the price of gold/silver. The reason for this is to prevent these two monetary metals from going parabolic and signalling to the world the severity of the west’s catastrophic financial and economic situation. The graph above shows the ratio of open interest in Comex gold futures to the amount of “registered” gold in Comex vaults. “Registered” is the gold that has been designated as available for delivery. As you can see, this ratio went parabolic in mid-2013. It is likely then that the enormous amount of physical gold being swallowed by China, India and Russia began to “stress” the ability of the Fed/bullion banks to keep a lid on the price of gold. It also, coincidentally or not, happens to coincide with the timeframe that I have identified as the peak of the current housing market mini-bubble (July 2013). In other words, I believe the wheels began come off our economy in the summer of 2013. If the fear was that the report would trigger a small interest hike from the Fed, that fear didn’t grip the stock market until later in the morning. Furthermore, the S&P 500 seemed to rid itself of that fear today, rising over 8 points while gold finished flat and silver was down 15 cents. There is a clear agenda to keep the price of gold/silver capped with paper derivatives. Leverage allows fundamental participants to hedge without having to pony up one dollar for each dollar of hedging power. Let's imagine you are that mine (or corn farmer) that wants to hedge your production. In a hypothetical non-leveraged world, the farmer/miner short would have to post $1 in capital for each $1 of production he was going to hedge. That makes hedging a whole lot more expensive for the hedgers. A lot fewer producers would be able to hedge their production. If your farm did $1M in corn production every year, you'd have to pony up $1M in cash to hedge it. Know a lot of farmers with a spare million just lying around? If your gold miner did $5B in gold production, they'd need to have $5B in cold hard cash. Gold miners have the same problem as farmers. They aren't cash-rich either. Lastly, your thought that leverage "sweetens" the pot suggests you yourself may not have taken leveraged positions in the past. At least in my experience, leverage isn't a sweetener, its a double-edged blade. The frequency of the $40 swings are an issue. Position sizing is the answer. If the banks aren't allowed to dump 5000 contracts into the market all at once, they can't routinely run the stops. And that would (I believe) largely solve the problem. It might actually bring back more "good speculators" too, many of whom have likely been chased out by all the daily shenanigans. We'd still have big moves up and down, but it would be due to stuff happening, not some kind of daily "Operation Bonus Maker." Again, those sorts of assaults are "quick ATM runs" for the bonus-hungry bankers, but they cannot set the trend. Otherwise - we would never have seen the bull market from 2001-2011. Yes, I know. But my point is not arguing about whether or not manipulation is happening, I'm only suggesting that whatever manipulation was occuring was simply not effective in changing the trend. Your straw man argument against manipulation is that the markets have risen in the past. Let's see. A "straw man" argument is misrepresenting someone's argument to make it easier to attack. That's not what I did. I made my very own case - not against manipulation, but against effective manipulation based on a review of past goldbug statements, logic, and price evidence. 1) Goldbugs dating back to the 70s have consistently accused the powers that be of effective, consistent manipulation of the gold market. 2) If we take this as truth, then the powers that be were manipulating the market from 2001-2011. 3) Viewing the price evidence, the manipulation clearly happening during this period was completely ineffective. Worst Manipulation Ever. 600% bull market. King Canute attempting to hold back the tide. And failing. It wasn't just one year. It was 11 years, and it was a massive move higher. And it just so happens, this bull move went right alongside a move higher in commodities, and a move lower in the dollar, which are two very important Golden Pillars of Jim Sinclair's Five Golden Pillars on which the big gold rally was based. For those that don't know who he is, Jim Sinclair is one of those long-time goldbugs - a goldbug legend to be sure. King World News calls him Mr. Gold. We don't hear much about Jim's Pillars these days, not the way we did back in 2010. Not sure why that is. They seem to make sense to me. If you'd followed them, you might have even bailed out of gold - or at the very least, reduced risk - once the pillars started to fail. Sinclair was even pretty close on the price target. And that took some gumption to say back in 2006 when he made the target. Recognized top in the US Dollar: FAIL. Dollar has rallied back to 100, a level last seen in 2003. Trust in USA Paper Assets Declining. FAIL. By any independent analysis, the US remains the core economy - the primary reserve currency, the safe haven in times of trouble. May not last - but its where we are today. Bullish general commodity markets. FAIL. Commodity markets have been in a nasty downturn since they peaked in early 2011 - just coincidentally, the same time gold peaked out. We're getting close to the 2009 lows in commodities, by the way. Certainly we haven't seen commodities at these levels since 2009. Triple deficits. PARTIAL SUCCESS. Deficit doesn't look great. However, it has fallen as a percentage of GDP pretty dramatically since 2011. Once again, that 2011 date looms large. Recognized top in US Long bond. FAIL. 35 year US treasury bull market still very much alive. In fact, we hit a new high at the start of 2015. 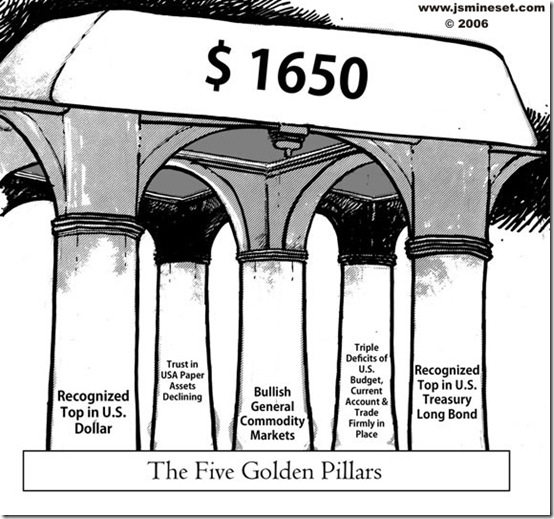 So according to Jim Sinclair, with maybe only 1 of 5 pillars in place, gold should be doing...what exactly? I know. Don't pay attention to Sinclair. He knows nothing. Its all manipulation. Even though he successfully predicted more or less the top, right alongside a pretty cogent description of what tends to be correlated with the price of gold. Again, my point isn't that manipulation doesn't happen. Its that it doesn't work. Clearly the forces in play - those Five Golden Pillars - were far more powerful than any attempt to manipulate price lower. And now, most of the Pillars are gone. Turns out, manipulation really does exist, and it works great - just as long as there aren't any Golden Pillars in place to support gold's move higher. Jim, you should really be happy. It means that once the Pillars return, gold will shoot higher, and there is nothing that any would-be manipulator can possibly do about it. It sure makes me rest easy. "But it is interesting how they got the year 2011 mostly wrong." Did they? Or were they just overwhelmed by investor demand? It was after that spike that TPTB and the perceived value of the dollar required the most ssophisticated algorithms and HFT to prevent that from ever happening agin. "So either they are causing the peaks and the valleys, or they simply have a pretty good sense of when they will probably occur." They are causing it, then they have a "pretty good sense" of what will result from their actions. A pretty good overview is provided of the previous day's manipulations Tues. through Sat. in Ed Steer's column. Personally I prefer to shun people who stand by and allow illegal activity to go on. Chris Powell has on several occasions brought up a federal law from the 1930's that would seem to allow the U.S. government to manipulate any financial market. But my understanding is the actions in the COMEX by entities like JPM violate the CFTC's rules. Shouldn't' the head of the CFTC enforce CFTC rules? Sure, its all about sophisticated algorithms. Couldn't possibly be about the widespread deflation we're experiencing that has dragged the entire commodity index back down to within spitting distance of the 2009 lows. Nope, sure couldn't be that. Its algorithms. Sophisticated algorithms. My sense is, the big guys ride prices up and down across the current trendline, going short at the tops and covering at the bottoms. Seems like a clever strategy. If we're clever too, we can notice what they do and act accordingly. The guys on surfboards don't create the waves they ride - they simply take advantage of them. Neither do the big guys have the power to set the trend - they just take advantage of it. "Sure, its all about sophisticated algorithms. Couldn't possibly be about the widespread deflation we're experiencing that has dragged the entire commodity index back down to within spitting distance of the 2009 lows." That is correct; gold and silver prices are where they are on the COMEX are due to manipulation NOT deflation. You no doubt have browsed the continual feed of articles at the home page of www.goldsilver.com or at http://www.caseyresearch.com/gsd like I have for years, and read some of the thousands of articles and listened to countless interviews there and in other places like I have. Few of the articles was even mentioning deflation until relatively recently, with the possible exception of people like Mike Maloney who was advancing the debate on which one we would have and when. Now everyone is on the bandwagon about deflation. IF gold and silver prices had operated without continual manipulation THEN the current prices would have come down some from deflation. But that is not the case. That is correct; gold and silver prices are where they are on the COMEX are due to manipulation NOT deflation. Are you arguing that manipulation is the driving factor or deflation? I'm on of those literal thinkers so if there was a nuanced point i didn't get it. I don't see why everyone finds deflation so hard to accept. The West isn't buying gold. Only 1 person i know even talks about it. Almost everyone else has mortgages to pay off, credit cards to repay, car loans to finance or student loans that need servicing. The world is drowning in debt. Where are all of these gold buyers going to come from? The game is up. Unless there is some debt jubilee on the way i don't see any immediate price action to the upside in commodities. It may even be a managed decline. Our rulers have been playing this game for a long time and so I assume that they will consolidate their position at any cost. That's how a food chain works. There was an interesting interview with Bill Bonner over at Money Week which places the emphasis on cash during a credit crisis which i found to be counter-intuitive but interesting none the less. The theory goes than when people can't get access to credit then cash really does become king. It would be interesting to hear people's thoughts. My conclusion from my research: it is deflation effects. I've been talking about that for quite a while. Its nice to hear the goldbug storytellers are finally starting to figure it out too. Just because they happen to be late to the deflation party doesn't mean that other, more observant, less pseudo-religiously-faithful didn't twig to the obvious and sell their GLD holdings long before. Deflation is driven by a decline in bank credit, and a lot of it is happening in Europe. Any time we are in that yellow box in the chart below - its deflation. Notice the wave of deflation just after 2012 going into 2013? That's when I first started to get really interested in deflation. Now everyone is talking about it. And as of right now, it looks like deflation is starting to ease up a bit in the EU. When it breaks above the 0% line, we're back to credit growth and inflation once again. You can see a similar drop in the rate of money creation in China. Their annual growth rate in M2 has been cratering since the high in 2010. Inflation expectations are driven by the rate of growth in money creation. If growth is at 30%, and drops to 10%, inflation symptoms drop. Gold becomes less interesting. where will gold buyers come from? I don't see why everyone finds deflation so hard to accept. The West isn't buying gold. Only 1 person i know even talks about it. Almost everyone else has mortgages to pay off, credit cards to repay, car loans to finance or student loans that need servicing. The world is drowning in debt. Where are all of these gold buyers going to come from? Indeed. That's my experience too. The "first wave" of gold buying was credit-creation related. That was from 2001-2011. That wave is done. Is anyone talking about hyperinflation? That's a tough sell these days, at least to "normal people" who aren't goldbug fanatics. I expect a second wave of gold buying to come following more widespread use of capital controls, sovereign defaults, and overnight currency devaluations. Also, if there are serious reflation attempts - serious attempts at dropping real helicopter money - that could drive more gold buying too. But until such things start to happen outside (say) Cyprus, the deflationary/downward pressures on the commodity index and the upward pressure on the buck means that gold will have a hard time taking off. "Where will gold buyers come from?" How about Asia? No mention of Indian or Chinese buying in above discussion...and it is massive. I hope you enjoy doing your own research, and I hope you get paid for it. But your research does not replace, supplant, or upstage research, interviews, and articles from dozens. You are of course welcome to have any opinion you want. Others have other opinions. "The drop in the price of gold is caused by sophisticated algorithms allowing the users of said algorithms to set prices to be whatever they want. (Why is gold at $1159 and not $35/oz? These are sophisticated algorithms, right?)" Really? I think that is an inane statement to make. But again you are welcome to any opinion you ant to hold. 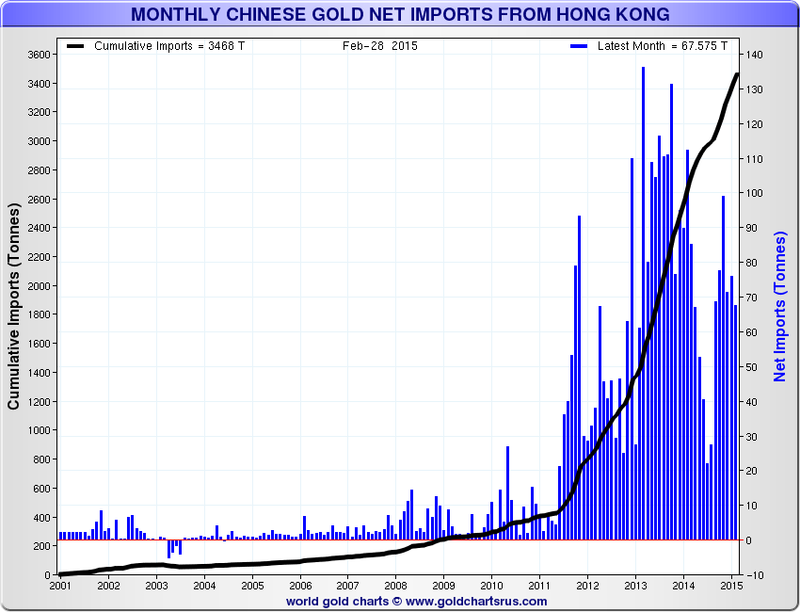 As a result, Jansen writes, withdrawals from the Shanghai Gold Exchange remain a good proxy for China's domestic gold demand, and 456 tonnes have been withdrawn this year through March 6. If annual gold mine production is around 2,800 tonnes and monthly mine production averages 233 tonnes and weekly production averages 54 tonnes, the Shanghai figures suggest that, as Jansen's chart shows, Chinese demand is running at about 47 tonnes per week, or about 88 percent of world mine production. Certainly it sounds like you have collected opinions from a whole lot of goldbugs that all say the same thing. Unfortunately, the facts of a situation aren't determined by popular vote. Example: if all the goldbugs got together and voted that "the world is flat", that wouldn't make it so. They call this an "Appeal to Popularity" in the list of Logical Fallacies. So no, your collection of opinions don't trump fact, simply because you have a bunch of people voting for a Flat World. I trust myself, and the information I've dug up. You trust your goldbugs, and the opinions they have. I'd be happy to have a debate on the merits, but is really tough to debate someone who only brings other people's opinions to the table which consist of one big assertion rather than any actual information that could be examined more closely to see if it had merit or not. For instance, I showed you several charts that indicate deflation. You ignored them and basically said "no it isn't." (c.f. Monty Python "The Argument Clinic"). I like Jim, who drags facts and data and charts in to support his claims. While he doesn't agree with me, at least he uses techniques other than "proof by repeated assertion." It's really tough to communicate with someone who is arrogant and pompous, and self-aggrandizing as well. I'm glad you trust yourself and the information you have dug up but in the end it is just your opinion. I'd be interested in hearing from the readers/contributors of this column/blog, who thinks the current spot price of silver is more reflective of COMEX market manipulation or deflation? What did Dave say that was arrogant and pompous? DC - I'd recommend spending a few minutes scrolling back through dave's posting history. He's one of the most level-headed, polite, objective and non-confrontational guys here at PP. Anyways.......whether the price of gold is being manipulated by deflationary Master of Puppets algorithms, or a goldbug Prom King popularity contest is of no consequence. If the price is moving - up or down - I can (and do) trade it. I even BUY and HOLD it - but probably for different reasons than most. So should you. All that other stuff is noise. I know you were asking for opinion (i.e. calling for an election in a matter that should probably be evidence-driven), but here is some evidence anyway. In the chart below, look at the line in the amber box. That represents the times when silver and the CRB had a positive correlation - the higher the value, the closer the correlation. Certainly sometimes silver and commodities diverge, but the fact that the correlation line spends the vast majority of its time within the amber box proves that silver and commodities move in the same direction most of the time. And I might have been a little hard on Mr DC. I find if I am nicer, the evidence tends to have a higher chance of being actually received and considered. Which I always have to remember, is the point of the whole exercise. As a participant in these markets, I can tell you that spreads are a big deal. Narrower spreads = a very good thing. It basically reduces the friction involved in taking a position. Narrower spreads lead to more liquidity, and more liquidity means the market functions better for its intended purpose." Besides the fact that you initially tried to belittle my arguments and intelligence by used words like "nekkid", you are fundamentally wrong in your thesis because you fall into the same trap and wrong-headed thinking that all statists and central planners do. That is the utopian school of thought which is that if we just put enough smart and high-ranking people in charge of important things, such as the gold market and the money supply, and the interest rate for lending, we can get rid of all the pain, suffering and corruption in the world. Never mind the fact that we are putting corrupt and flawed people into a position of great power to, wait for it, get rid of corruption and too much power. Seems a bit circular, doesn't. In fairness, I don't necessarily believe your motives are wrong. And yes, all the difficulties with non-liquid markets you point out are correct. Wide spreads, slow transactions, "friction" (another funny and non-precise word like "liquidity", but I digress). All of it. You simply miss one huge fact- markets that are relatively non-liquid are supposed to be non-liquid. They are non-liquid for a critical reason. Because there are simply fewer buyers and sellers. Markets that are highly liquid are highly liquid because they have more buyers and sellers. There is no such thing as too little liquidity and too high liquidity. There is only market-correct liquidity. Now you may not like the level of liquidity of a given market. That's a YP not an MP (Your Problem, not My Problem). I don't like the fact that I don't have a magical unicorn pooping gold nuggets in my back yard. Doesn't change fundamental reality, does it? Does fewer market participants that create wider spreads? Yes. Does that create slower transactions? Yes. That is the nature of markets. Free markets have spreads and deliveries based on honest, real participants. Free markets should be free, not based on puppet-master participants setting price, spreads and volume where they believe it "should" be (or where it can most benefit their checking accounts and theories of macroeconomics,). There are no perfect markets. Only free or not free markets. What you and your ilk have created are distorted, manufactured markets. Markets that hardly have any connection to an underlying "real" world. I don't know what your motives and world view is. If you are like all leftists and central planners, your world view can derive from a couple of zones; good-hearted, wrong-headed motivations to "fix" things that don't need (government) fixing, or from corrupt, greedy and power hungry desires, but the net effect is the same- distorted, corrupt and broken markets. And the fact is that real hard-working, honest people who suffer at the hands of foolish or sociopathic "leaders" who seek to manipulate these markets, most often for their own selfish gain. Markets ruled by a few 'enlightened' individuals are set where "they" (the "enlightened ones") believe they should be set, not where the real world wants to set them. In a free market, if a market has fewer participants and the spread is $5, then that is a "free and fair" spread. Artificially ginning up "liquidity" by fake paper gold and participants who have no interest in buying or selling the product i.e. participating in a market, is not "fair". It is not free. Does fake paper gold it create artificial liquidity and lower spreads? Does it create a whole raft of corruption and market distortion, along with the glorious shrinking of spreads? Like all Laissez-faire economists, my world view is that you should align yourself with the real world of economics, both human/ personal economics and natural resource-driven economics. Not with what some central planner believes is "correct". Not with corrupt motivations of profit-driven executives nor power-hungry Fed officials and government officers. In the former, one gets Twitter, Amazon and smartphones that cost less than months salary and have the power of earlier super computers in them. In the later, one gets 6 million Ukrainians starving to death because the politburo believed it knew what the "right" model was for growing wheat. Actual market buyers and sellers of gold and silver would set the natural price for precious metals (in the respective country currencies), based on supply and demand. Supply being limited by natural cost of production, ready availability of mine able ore, motivations of existing holders of physical gold to sell, and demand as a function of jewelry consumption, solar panel manufacturing, and faith and confidence that the world monetary and financial systems were being run correctly and that the chance for future growth was high and fiat currency devaluation and money-printing was low. Not based on where central banks and governments believed the price "should" be. To encourage false confidence in fiat money. For what its worth, I don't believe you would see the extreme differences you list in your examples. Would spreads go up? Yes. Would they be manageable? Yes. There would also be a good consequences to higher spreads. Participants would be more careful and thoughtful about trades, since the cost of the trade would require more analysis and commitment on behalf of all participants. Analysis, thoughtfulness and commitment are good things in my estimation. To be clear, I am in favor of technological and policy advances to enhance liquidity of markets in general. I am not a Luddite and would be highly supportive of advances to connect actual buyers with actual sellers. This is a public good. Allowing the buying and selling of fraudulent gold, and outrageous monopolization of markets by huge positions of mostly fraudulent gold, is bad for the rest of us. I'm definitely on record for limiting position sizes, so that the puppet masters have a harder time running stops and doing other objectionable things that have nothing to do with proper functioning of the market. However, you go to the next step, where you suggest we need to get rid of the market makers in order to make sure that only what you consider legitimate, fundamental participants get to buy and sell. In your dream futures market, everyone would be required to either take delivery or to deliver product. Now this really blows my mind. You portray yourself as some sort of free market capitalist economist, and here the free market has gone and provided these people - market-makers - free-market actors who are willing to take on risk in order to profit from the spread and add liquidity (thus narrowing the spread, a perfect example of increased efficiency by allowing a market to function freely), and you'd like out outlaw them because they don't suit your idea of what "good market participants" should look like. And in the next breath, you decry what I talk about as "central planning". Simply amazing. One wonders how you deal with all that cognitive dissonance. As a participant, I like market makers - as long as they are small. That's because lots of small participants leads to a more efficient market. What I don't like are the casino-bankers who can drop huge positions onto the market to run stops and enrich themselves - and position size limits fixes this. But I do like market makers. Put more simply, I like the babies, but not the bathwater. Neither do you speak much of the fundamental demand drivers.. the actual buying and selling of Gold.. the actual trading of Gold which is actually supposed to determine price. When was the last time you quoted the latest SGE withdrawal volume in one of your commentaries? Why do you poo poo the changes to the flow of Gold, one depiction of which can be seen below, as being so inconsequential? You seem to have really selective hearing when it comes to which charts speak to you.. and which charts don't. But the gold numbers were shocking, as the Commercial net short position blew out by a further 27,174 contracts, or 2.72 million troy ounces. The Commercial net short position has now risen to 10.83 million troy ounces---and Ted says that we are now market neutral in gold, just like we are market neutral in silver from a COT perspective. I have a 30-day gold chart below that shows what happened during the reporting week, but I want to get the rest of the gold numbers out of the way first. Ted says that in response to last week's gold "rally," the Big 4 added 3,000 new short contracts---and the '5 through 8' Commercial traders added another 4,200 new short contracts---and the small traders, Ted's raptors, sold almost 20,000 long contracts for a profit. All this happened in response to the technical funds in the Managed Money category, as they bought longs and sold shorts. They added 8,939 long contracts---and decreased their short position by 10,680 contracts, for a total of 19,619 contracts. The balance of the 27,174 contract change in Commercial net short position came from the small traders in the Nonreportable category. 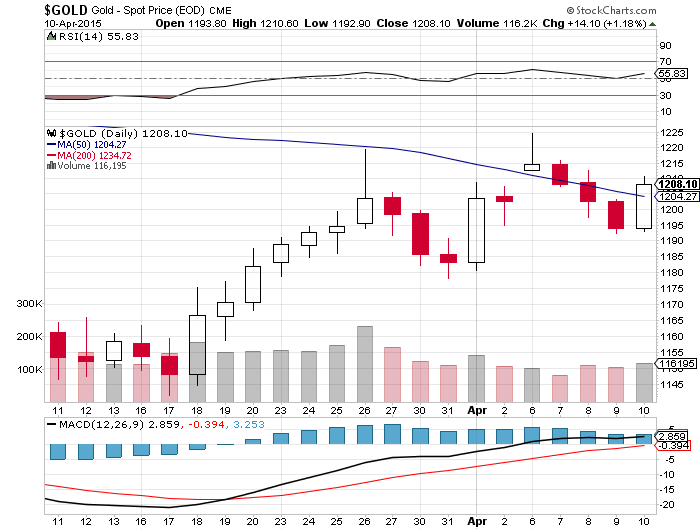 Here's the 30-day gold chart. The huge deterioration for the week came on April 1 through 6---Easter weekend---and JPMorgan et al were standing there sledgehammer in hand to make sure that the explosion in the gold price that would have occurred at that point never happened. It was price management at its most ugly and crass---and exactly the same as what happened in silver a couple of weeks ago. The truth is that the largest, most powerful bank cartel is managing the Gold price, and their tracks are obvious to those with eyes to see. Gold as a form of money is not being allowed to trade higher relative to dollars.. it is NOT being allowed to play the asset bubble game like other assets.